Ten exhausting and fast-paced, short, sharp races were held on the first of four days of racing at the Extreme Sailing Series in Cardiff presented by Land Rover. The eight teams were put to the test on Cardiff's typically tricky race course, contending with 40° shifts and 23 knot gusts. The Wave, Muscat may have won the day with an 11-point lead at the close of play, she didn’t have it all her own way. A collision in the third race at the windward mark with SAP Extreme Sailing Team resulted in serious damage to the Omani boat's tiller bar. Despite the crunch of cracking carbon, none of the crew were hurt, but with the damage irreparable on the water, the team limped back to the pit lane for repairs. Five races later, tiller bar replaced, The Wave, Muscat came back fighting, with two wins and a third in the final three races of the day – the defending Cardiff ESS champions top leaderboard on 90 points (with redress). Back on dry land British Olympian Leigh McMillan explained: “We had a manic repair trying to get our broken tiller fixed, it was quite technical and difficult trying to get the rudders back on in a fashion where they are actually going to steer the boat. Eleven points behind The Wave, Muscat in second place, Oman Air had an outstanding day, consistently hitting the podium in eight out of the ten races – the predominantly British crew, led by Olympic 49er sailor Stevie Morrison, is setting a course for its first podium finish of the season. 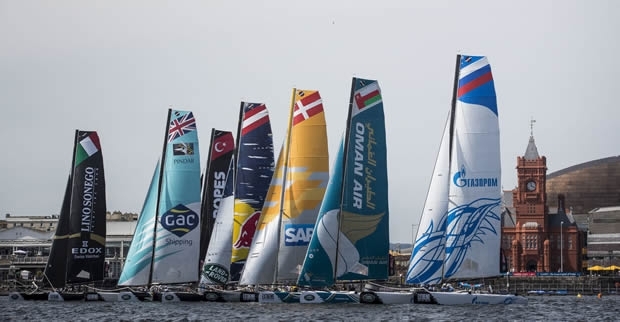 Despite their chilled out approach the Oman Air boys will have to work hard to stay ahead of the game, with current overall Series leaders SAP Extreme Sailing Team just two points adrift on 77 and rounding off the overnight leaderboard. The fastest boat on the water and sailing the shortest course according to SAP Analytics, the Danish team had a shaky start to the day, but, five races in, the team finally clicked into gear, finishing the day with five podium results. 1. The Wave, Muscat (OMA) Leigh McMillan, Sarah Ayton, Pete Greenhalgh, Ed Smyth, Nasser Al Mashari 90 points. 2. Oman Air (OMA) Stevie Morrison, Nic Asher, Ted Hackney, Ed Powys, Ali Al Balashi 79 points. 3. SAP Extreme Sailing Team (DEN) Jes Gram-Hansen, Rasmus Køstner, Thierry Douillard, Mads Emil Stephensen, Brad Farrand 77 points. 4. Red Bull Sailing Team (AUT) Hans Peter Steinacher, Jason Waterhouse, Jeremy Bachelin, Shaun Mason, Stewart Dodson 74 points. 5. GAC Pindar (GBR) Chris Draper, Seve Jarvin, Tyson Lamond, James Wierzbowski, Kazuhiko Sofuku 73 points. 6. Gazprom Team Russia (RUS) Igor Lisovenko, Phil Robertson, Garth Ellingham, Alexander Bozhko, Aleksey Kulakov 66 points. 7. Team Turx powered by Kaya Ropes (TUR) Mitch Booth, Can Bayulken, Selim Kakış, Diogo Cayolla, Pedro Andrade 46 points. 8. Lino Sonego Team Italia (ITA) Lorenzo Bressani, Enrico Zennaro, Andrea Tesei, Tom Buggy, Stefano Ciampalini 45 points.